BGL Basics: How Do I Enter Harvest Data? 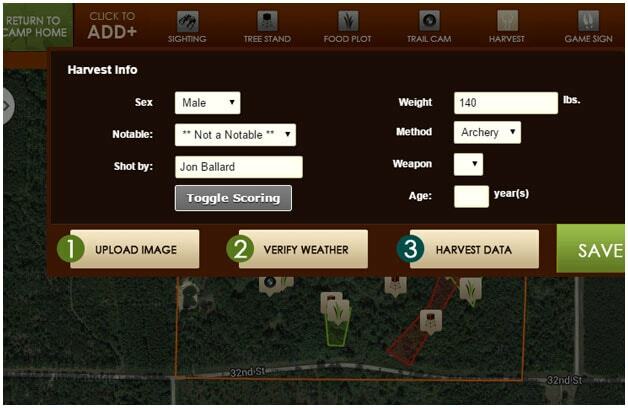 Harvest data is similar to Deer Sightings. From the Map Editor (by clicking on Add Items to Map from camp home) you can click on the Harvest icon and click on the map at the location the deer was shot. Now you can upload a picture of your kill (either pose with deer or trail cam image) and follow the same instructions for sightings. It will treat this as a deer sighting because this is data you want to store. Note: If you use a posed image, make sure you update your date and time to reflect the correct date and time. The last window for the Harvest data is where you can enter your Harvest data. If the deer you shot was a notable deer, make sure you mark as so because this will then update the Notable screen as decease and you will no longer have to worry about tracking this deer. Click save and this harvest has now been stored and added to your trophy room.